The central topic of this thesis is variation in the nominal domain of Dutch dialects. 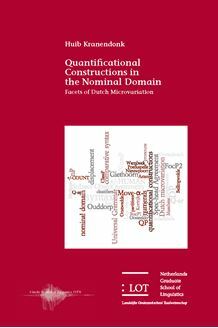 It discloses a vast amount of new empirical data as well as theoretical analyses concerning the syntax of quantificational constructions in general, and numerals, quantitative er, universal quantifier alle and partitives in particular. This thesis provides insight into two main questions of theoretical comparative linguistics. Firstly, it shows clearly that taking into account the full array of microvariation reveals aspects of the architecture of the noun phrase that could not have been established on the basis of the standard language only in particular the role and position of several functional projections. Secondly, the close and in depth comparison of several varieties of Dutch provides new information about the locus of syntactic variation. The detected points of variation are (i) the morphological realization of functional heads and (ii) the possibility to move to functional projections. This thesis is of interest to anyone working on generative grammar, the syntax of the nominal domain, numerals, (quantitative) pronouns, partitives and (micro)variation.